Bring your own water as potable water is not available in the park. Nalbeelah Creek Wetlands Provincial Park protects a provincially significant wetland complex with unique geological features. The wetlands formed in an earth-flow crater and evolved into a complex of raised acidic bogs. In addition, the park protects the habitat for Grizzly Bears, one blue-listed plant species (Bog adder’s-mouth orchid) and one blue-listed plant community (Black Cottonwood / Red-osier Dogwood). The wetlands also provide high-value Coho Salmon and Cutthroat Trout rearing habitat. Nalbeelah Creek Wetlands Park is located about 10 km north of Kitimat, in a area east of Highway 37 and south of Nalbeelah Creek. There are old, narrow, overgrown logging roads leading into the park and access can be difficult. Use NTS Map Sheet #103 I/2. History: Nalbeelah Creek Wetlands Provincial Park was designated as a park on May 20, 2004 following recommendations from the Kalum Land and Resource Management Plan. 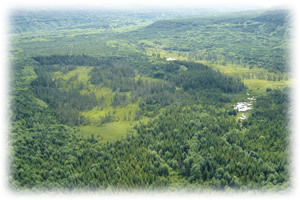 Conservation: The Nalbeelah Creek Wetlands protect a provincially significant wetland complex with unique geological features, having formed in an earthflow crater. After earthflows occurred depressions were left at the landslide sites. Wetlands developed in areas where the depressions were lower than the permanent water table. These have since developed into a series of raised acidic bogs, formed from the gradual build-up of organic material. The sphagnum peat in the bog is between 2.3 and 4-m thick. This organic bog material has been carbon-dated to determine the timing of the earthflows. The earthflows are thought to have occurred between 1500 and 2650 years ago. One Provincially Blue-listed vascular plant has been reported in the Nalbeelah Creek Wetlands, the Bog adder’s-mouth orchid (Malaxsis paludosa). Also, one Provincially Blue-listed plant community is reported in Nalbeelah Creek Wetland Park, the Black cottonwood / red-osier dogwood (Populus balsamifera ssp. trichocarpa / Cornus stolonifera). Wildlife: Wetland habitats are very highly valued for Grizzly Bears. The wetlands also contain valuable rearing habitat for Coho Salmon and Cutthroat Trout. Nalbeelah Creek has been identified as having a Chum Salmon run that is at a high risk for extinction. Online Management planning information for this park is not available at this time. Canoers may enjoy exploring this park; however, access can be difficult. For your own safety and the preservation of the park, obey posted signs and keep to designated trails or old roads. Shortcutting trails destroys plant life and soil structure. There are old, narrow, overgrown logging roads leading into the park and access can be difficult. The park is open to hunting. Please refer to the British Columbia Hunting Regulations for more information. Campfires are permitted. Firewood is not provided. If you must have a fire, please burn only dead and down wood, and be sure to extinguish the fire fully. Dead wood is an important habitat element for many plants and animals and it adds organic matter to the soil so please use it conservatively, if at all. We encourage visitors to conserve wood and protect the environment by minimizing the use of campfires and using camp stoves instead. Limited burning hours or campfire bans may be implemented.